Scott Poulter (CEO, GP Masters): Make no mistake, out on the track its gloves off and no prisoners are taken – as we have witnessed at the opening two rounds in South Africa and Qatar respectively! For many of the star studded line up of drivers here this weekend at Silverstone, there are other, more personal attractions; renewing old friendships, good humoured banter (you’ve never been to a Press Conference like one of ours! ), and most significantly a re-connection with the ‘fans’ for whom the Grand Prix Masters has really rekindled their interest in Grand Prix racing. True heroes were always going to appeal to real motorsport fans, and even those who watch from a distance. You won’t find the same levels of egos, secrecy, arrogance and politics as you might in other areas of motorsport. Everyone races on a level playing field and in trust… and the drivers and fans love it. No external aids, no pit stops or tyre changes… it’s all about the driver. Considered by many to be one of the fastest and most challenging circuits on the Grand Prix calendar, Silverstone is a mixture of high and low speed, world famous corners and long straights. Two years from concept to Silverstone, one year from drawing board to driving flat out around the home of British motorsport. Fantastic and a credit to all involved. This will be a weekend to remember! Enjoy." Murray Walker O.B.E (Commentator, GP Masters): "Being back with my mates like Nigel Mansell, Derek Warwick, Riccardo Patrese, Rene Arnoux, Emerson Fittipaldi, Stefan Johansson and Derek Warwick about whom I must have spoken tens of thousands of excited words as they fought for supremacy at Silverstone, which is so spectacular and which the drivers love so much, is very special indeed for me. And alongside me in the commentary box is going to be one of my all-time heroes, World Champion Alan Jones. Magic! Having seen the Masters in action at Kyalami in South Africa and the searing heat of Qatar I know that they’ll all be taking their return to Silverstone very seriously indeed and that the cars are second only to Formula One’s projectiles in terms of performance. I’ve gone through the roof so many times at Silverstone over the exploits of Nigel Mansell and he’ll be out to fire me up again but can he make it three wins in a row? Not if the others can stop him and, believe me, they’ll all be determined to do so!" Rene Arnoux (France): "Silverstone will be yet another opportunity to reacquaint myself with great friends and magnificent driving machines. I cannot tell you how much I love this series. It’s pure, raw and undiluted racing. The organisation behind the series is first rate and the passion we al share is clear to see both on and off the race track. Driving the GP Masters car for the first time last year was something very special indeed. I remember those first few laps like they were yester-year and I still have that smile right across my face. It was like we’d never been away. I’m sure Silverstone will be a great success this weekend with many of our supporters in attendance. Nigel, I know you’ll be at full strength at your home race but I’ll be fighting you to the last lap, I can assure you!" Eddie Cheever (USA): "I went to the first race in South Africa more out of curiosity than to race. I was curious to see how the drivers I had raced against in the eighties had aged, how Kyalami had changed, and of course I was curious to see if I would enjoy driving a car that was by all accounts as fast, if not faster, than what I had stepped out of in Australia at my last F1 race. By the second day of practice I was totally into the driving even though I was out of breath after three laps. 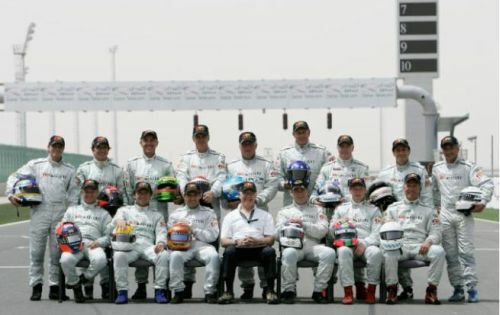 Although everyone was older all the drivers had the same character traits as they had 20 years ago. Qatar was completely different than the first race. Everything had been turned up a notch. The cars were better prepared, the drivers were more fit and the driving was a lot more aggressive. I am quite sure that Silverstone will be another jump forward. I have trained harder than I have ever done, not because I have to, but because I am really enjoying the whole thing. I see my chances at Silverstone the same as Qatar. Mansell is 2 always hard to beat on any race track, and with all those Brits cheering for him he will be even more charged up than usual. All the more fun to beat!" Christian Danner (Germany): "Can Nigel be beaten in his own backyard this weekend? Well, to cut a long story short, Nigel is exceptionally fast, drives the car in the race extremely cleverly and he’s quite hard to get past. However, there is no reason not to overtake him. The only problem is, there are 16 other drivers who have a pretty similar understanding of what I just told you. The home crowd certainly gives the Brits an extra bit of pressure but whether you call that an advantage or not, remains to be seen." Andrea De Cesaris (Italy): "I have been driving in England for many years during my F3 time and I feel Silverstone is my home circuit! I guess there will be thousands of people looking for Nigel to win, but I really want to have a great result in Silverstone. I still regret Qatar where I was fighting with Mansell, Cheever and Danner for the lead but the safety car restart just ruined everything for me, so Silverstone is just the right place to set the record straight." Emerson Fittipaldi (Brazil): "I’m sorry for all the Nigel fans that are coming to Silverstone, but I’m going to beat him. I know it’s going to make me unpopular because I know how popular he is there. But three races running would be too much. I gave him a really hard time in the first race at Kyalami – I even got alongside him a few times – but at the second race in Qatar I had an electrical problem with my engine that kept me down to sixth. But for Silverstone I should have a car as good as I did at Kyalami – and I’m going to beat him, for sure." Stefan Johansson (Sweden): "Qatar was a great event, they have built a modern and very beautiful race track there and the hosts did a terrific job making us a feel very welcome to their country. I can't wait, however, to be back at Silverstone! It's enough to drive trough the gates of that place to feel the atmosphere. The British race fans are the best in the world and I think we can expect some very motivated drivers this weekend at what promises to be ‘the’ event of the World Series so far." Jan Lammers (Netherlands): "Confidence has never been a problem for me and Silverstone will bring out the best in everyone, it is the heart of motorsport after all. We know what it does for Nigel and that makes the challenge even stronger for me. Derek will also no doubt drive with that extra ‘public power’ behind him. Having said that, there is only one limit of the car and if you drive on it, it will give the ultimate result, for the particular car that you're driving that is! This brings in the teamwork and therefore I am really looking forward to working with the guys on my car again and see if together we can optimise the level of our game and find the perfect set-up for the track and the conditions that we are about to encounter." Nigel Mansell O.B.E (UK): "First and foremost the competitiveness has never changed and certainly hasn’t diminished. It is the same as it has always been and in some cases the competitiveness between certain individuals is even greater! Silverstone is certainly one of the most historic Grand Prix circuits in the world and to be racing there for any of us will be a very special occasion. We have upwards of 650 brake horse power in what are equal cars with electronic aids being kept to a minimum. The on-track battles are intense with cars power- sliding all over the place! It really is an astonishing display of competitiveness combined with incredible camaraderie off the track. The rivalry between us all will be no different from those glory days back in the 1980s and 90s but given the challenge of Silverstone this weekend, the demands of racing will be tougher for all concerned. While the primary objective here is fun, entertainment and unprecedented access for race fans, the preparation, commitment and desire to win will be no less to what we witnessed in South Africa and Qatar. In fact, the desire to win this one will be even greater amongst us all!" Pierluigi Martini (Italy): "Qatar was a great and positive experience since it was my return after many years and I felt at ease. Silverstone will be even better since we will be racing for a keen and expert public, who will appreciate the homecoming of GP Masters. Tomorrow’s test session will be the first time I have driven the car since Qatar and of all places, Silverstone! I never ever expected to be in this position again since retiring from the sport and the thought of taking on Nigel, Emerson, Ricardo and the others at the home of motorsport is something 3 one only ever dreams of. With so much public support expected for Nigel and Derek, the pressure will be on us all to make sure a different winner graces the No.1 spot on the podium this weekend." Ricardo Patrese (Italy): "What began as fun between us in South Africa is now serious business on the track. The competitiveness and desire to beat one another hasn’t left any of us and I can only begin to imagine how this will manifest itself at Silverstone this coming weekend. This extremely fast and technically demanding track will lend itself very well to these thoroughbred race cars. The challenge posed by this, however, will be considerable particularly when it comes to finding the optimum set-up. We have two races under our belt and I will be looking for sure to improve upon my 3rd place in South Africa. I have incredibly fond memories of racing at Silverstone and I only hope I can add to the list this weekend at what promises to be tremendous home support for Nigel and Derek. Not that I want to spoil the party but I’ll be doing my damest to make sure I finish ahead of them both." Eric van de Poele (Belgium): "My tactics for the weekend ahead? No tactics! Just flat out as long as possible. We have this fantastic chance to drive very competitive and reliable grand prix cars. It gives us the opportunity to drive at 100% during the whole race. We just need to be fit enough to use this potential during the entire race...not easy at all. Personally, I have never been very competitive at Silverstone and I do not know why. It is a very demanding and technical track, so you must be good in all sectors. I will try to learn quickly the secrets of some of my buddies during the practice sessions of course! After Qatar, my neck was a bit sore, but not as much as my abdominal muscles…….because of laughing and how much fun we have!" Eliseo Salazar (Chile): "Qatar was definitely a highlight in my 32 year career in motor racing. The nature of the circuit, the atmosphere, the competitiveness, and everything else that went with it! I'm really looking forward to Silverstone though albeit let’s hope the current spell of hot weather stays for the weekend! If it does rain, however, I believe the cars will handle really well in the wet because they have excellent mechanical grip. Either way, the British fans are in for an absolute ball this weekend." Hans-Joachim Stuck (Austria): "Coming back into single-seaters with the Grand Prix Masters cars after a gap of 20 years, first with the testing at Silverstone then the first race at Kyalami, I realised how badly I’d been missing it, without ever realising. The feeling in sports cars and touring cars is not the same. A single seater is the ultimate, especially going from 1980 to 2005 - you can imagine the technology advances. I was happy because it wasn’t difficult to fit in the car as I’m taller than most drivers and it always used to be such a squeeze. I was amazed at how much more space there was than before. The way the car reacts when you make tiny adjustments to the ride height or a little wing adjustment is significant and very rewarding to work with. The biggest thing to re-learn was the acceleration. You’re laying down so much in these cars compared to the sports cars and touring cars I’ve been driving. With the lateral forces it was no problem but the acceleration and braking forces really gave my neck a hard time because of this driving position. So I bought myself a headband and a 1.5kg weight and between the Silverstone test and the Kyalami race, every day I was doing 500 repetitions of moving my head back and forwards with this weight attached to build up my neck muscles. After that it was no problem and it should stand me in good stead for the ‘neck-breaker’ that is Silverstone!" Patrick Tambay (France): "I believe that after getting this act so successfully on the racing road in South Africa and Qatar, that Silverstone will be much awaited by all the European racing family…my phone is already ringing from calls from long lost racing friends who are going this weekend and everyone is impatiently waiting for the weekend to start. This will be a MAJOR and passionate reunion for everyone who has counted down the days for this magic to re-created………mechanics, fabricators, technical partners, media, from the sixties, seventies, eighties, nineties will all be, I believe, reunited for the same reason…PURE PASSIIONATE PLEASURE AND FRIENSHIP….I can hardly wait…I tell you, it will be AWSOME…"
Derek Warwick (UK): "Silverstone is the most demanding circuit so far for GP Masters and it will take a big commitment to go fast here with speeds reaching 200mph. Silverstone is a ballsy circuit and for sure Nigel & I will be up for a big fight, it is our home Grand Prix and we both have a lot of fans to please. People keep asking me "why" is Nigel winning all the races so far? Simple. He’s doing a better job than the rest of us! But that’s hopefully going to change this weekend. Do I think Nigel’s faster than me? NO! Has he got more experience winning races 4 than me? YES! But I’m tired of making excuses. Silverstone has been billed as Nigel’s homecoming but I’m sorry to disappoint you all but it’s my homecoming too and I’m not going to let anyone down this weekend – especially my fans. Nigel has become our benchmark and his record speaks for it self - 27 Grand Prix wins, the F1 and Indy Car champion back-to-back and almost winning Indianapolis in his first year on the ovals. This weekend, however, we are all in equal cars and there’s no better place to go head to head with Nigel than Silverstone in front of home support."